Riding my bike past Liberty Park on a particularly warm April day this spring, I spied a man dangling from one of the park’s giant Siberian elms, the soles of his shoes 30 feet above the ground. I had nowhere to be in a hurry, so I allowed myself to be pulled in by the strange scene. As I approached, the man came sliding down a thick climbing rope, landing gently on the grass with a soft bend in his knees. I continued to watch as the man—strong and bearded and standing well over 6 feet—unclasped the rope from his chest harness and began handing it off to one of the two other tall, brawny men standing near him. Intimidated though I was, my curiosity proved stronger. “That looks like a lot of fun,” I said, stepping in. 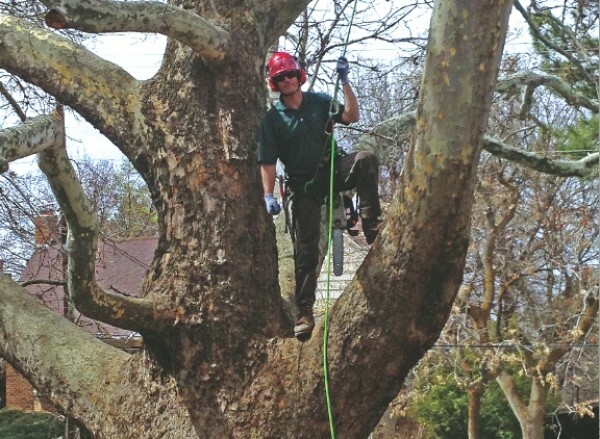 That’s when I met Christopher Erickson, the head arborist with Arbor Works in Salt Lake City. Erickson’s introduction to tree-climbing, he told me, came while he was a student of forestry in upstate New York. The challenge and the aesthetics of working in trees convinced him to make climbing them part of his job. Now, he admitted, hanging out in trees wasn’t at the top of his post-work chill-out activity list, though I’d caught up with Erickson and his friends doing just that on an afternoon off. They were also there for another reason, to practice for the 20th annual Utah Tree Climbing Championship, held this year on June 6 and 7 at Provo’s Pioneer Park. I’m not a total climbing novice. I know how to put on a rock-climbing harness, and I’m not especially afraid of heights. But when Erickson offered to let me climb, I made sure to get a full briefing on how to use the saddle and how to descend. A surge of adrenaline as I pulled myself off the ground left me winded. I barely made it 15 feet. Turning back, I began following the steps Erickson had laid out but then realized something wasn’t right. I couldn’t grab enough rope to set the metal figure-eight that would allow my smooth descent. My body weight held the rope too taught. My arms were starting to tire and shake. “Lean back,” I heard one of the men shout from below. Lean back? It didn’t make sense. Finally, I sat. The saddle held me as I swung in the breeze, my feet dangling like a small child on a playground swing set. I took a deep breath, looked around and then slipped slowly back down.